Through the first goal, we will have fun with activities that will help your child to learn to sing in tune and to play or move to a beat correctly. Chants and finger plays: They have a strong beat and are lots of fun! Rhythm Patterns: We will do these frequently during class and you will hear them on your CD. They will be call and response. 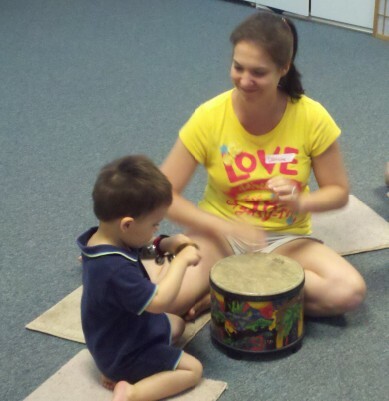 Instrument Play: We will explore rhythms on individual instruments and have free choice for our play-a-long. Movement and Dancing: We will move around a lot during the class, dancing and creating small and large movements. Tonal Patterns: Melody and tone are the building blocks of music and when they are separated children understand them better. You will hear tonal patterns in class and on your CD. They will be call and response. Singing: We will sing songs with words and without words so children can experience melody and rhythm without the challenge of a lot of words. We frequently sing in syllables called "vocables"
The activities are structured so that all ages can participate at their own level. There will be mixed ages in each class. Together we will show children what music looks like, sounds like and feels like. You are your child's most important musical role model , so your participation in singing and moving is key ,regardless of your musical ability; just show your child that you are having fun!. Relax and enjoy yourself and resist the impulse to control your child's responses (i.e. clapping hands for them, correcting the rhythm etc.) Appreciate your child's own response and learning style. Your child will learn by watching you! It is OK for the children to move around freely within a safe boundary. If the instruments go into their mouths, we have a special basket to place them in and we will disinfect them. It is also OK for the children to hold onto the instruments if they are not quite ready to give them up. It is very important to keep socializing with other adults to a minimum during class in order to keep the class flowing and to keep the focus on your child. Chatting during the songs creates a very distracting murmur for the children and the teacher. It is also important to be quiet between the songs . This is when we will be listening for responses from the children and your teacher will be introducing tonal and rhythm patterns. You are welcome to stay after class to socialize. You may make up any missed classes but they must be scheduled on the website within the current session. We ask that you "unscheduled" if you cannot come so the space can be open for another family. Refunds will be issued if cancelled before the first class start date. Refunds minus $30 fee will be issued if cancelled after the first class. Materials must be returned unopened or an additional $50 will be deducted from the refund. There will be no class if the school where you class is located is closed or delayed for a storm. You can watch TV on channel 9 for Portsmouth or channel 6 for Kittery closing announcements. It will also be posted on the website or you can call the studio and if we are closed there will be a recorded message 603-431-4755. We will make every effort to make up any missed classes by adding onto the end of the session.